Description: Convenient organiser for your tech equipment including phones, cables and power charges. Features: Use our Tech Trap technology to transport your iPhone, Blackberry, Android phones, iPod or other technology devices plus their complementing cables and power devices, Place into any bag for convenient storage or transportation. Colour: Black. Product Size: 222mm(h) x 167mm(w) x 12.7mm(d). Decoration: Screen Print. Decoration Area: Screen: 100mm(w) x 80mm(h) - Below zipper on back. Phone, iPod and USB drive shown are not included. Family Light Up Gift Set in Zippered Case#NAME? Compact 1 Amp car charger with an LED that lights up when in use. Colours: Silver, White, Yellow, Orange, Red, Green, Blue, Black. Dimension: Dia 24mm x L 54mm. Print Description: 20mm x 15mm. Print Type: Pad Print. Packing: Loose packed. 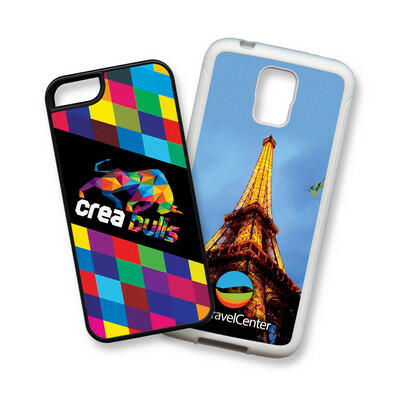 Series of soft touch plastic smart phone covers. All models can be ordered together and only one setup charge will apply to each order. Covers for smart phones not currently in stock may be available on indent and the series will be updated as new models become available. Models available ex-stock: Galaxy S5, Galaxy S5 Mini, Galaxy 6, Galaxy 6 Edge, Galaxy 7, iPhone 5, iPhone 6, iPhone 6 Plus, iPhone 7, iPhone 7 Plus. Colours: White, Black. Dimension: Dimensions are variable. Print Description: Please refer to template. Print Type: Sublimation Print. Packing: Loose packed. Setup charges only apply once regardless to the number of different phone case models chosen. Series of PU leather look smart phone covers. The covers will hold two credit cards and have a secure magnetic closure. All models can be ordered together and only one setup charge will apply to each order. Covers for smart phones not currently in stock may be available on indent and the series will be updated as new models become available. Models available ex-stock: Galaxy S5, Galaxy S5 Mini, Galaxy 6, Galaxy 6 Edge, Galaxy 7, iPhone 5, iPhone 6, iPhone 6 Plus, iPhone 7, iPhone 7 Plus. Colours: White, Black. Dimension: Dimensions are variable. Print Description: Please refer to template. Print Type: Direct Digital. Packing: Loose packed. Setup charges only apply once regardless to the number of different phone case models chosen. 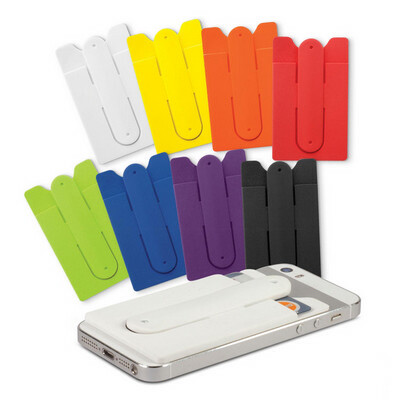 Soft touch silicone wallet with a handy snap out phone stand which adheres securely to the back of a phone or phone case with strong 3M adhesive that won't leave marks if removed. It is ideal for holding a driver's licence, ID, hotel key, credit card or business cards. Colours: White, Yellow, Orange, Red, Bright Green, Blue, Purple, Black. Dimension: L 96mm x W 57mm x 4mm. Print Description: Print Type: . Packing: Loose packed. Stick anywhere Bluetooth speaker with a soft touch silicone finish which produces high quality sound reproduction and has a strong suction cup base which allows it to be fixed to most surfaces. It is compatible with all mobile devices that support Bluetooth and it has a wireless connectivity range of approximately 10 metres. Playing time is 4-5 hours and it is easily recharged from a laptop, power bank or USB mains charger. Klingon is presented in a Black box with a micro USB cable and an instruction leaflet. Colours: White, Black. Dimension: Dia 61mm x H 55mm. Print Description: Top - 17mm circle (in front of buttons). Print Type: Pad Print. Packing: Individual boxes. 2200mAh round power bank with a smart aluminium finish. It is ideal for charging mobile phones, tablets, cameras, GPS, Bluetooth speakers and headphones etc. Recharging time is 4-5 hours and the lithium ion battery can be recharged over 500 times from any USB port or mains adaptor. Comprehensive instructions along with a micro USB cable are included and an optional EVA carry case along a wide range of accessories are available for an additional cost. Laser engraves to an oxidised White colour. Colours: Power bank: Silver, Blue, Black. Carry case: White, Yellow, Orange, Red, Bright Green, Blue, Black. Dimension: Power bank: Dia 22mm x L 92mm. Print Description: Power bank - 60mm x 12mm. Print Type: Pad Print. Packing: Individual boxes or an optional carry case. Features: Moulded PVC cap, 3D engraved light-up logo with blue or red LED. Grade A memory, 10 Year warranty on data retention, 1 year replacement warranty on faulty manufacture.. Certification: CE, FCC, USB2.0, RoHS. Product Colour: Customised PVC. Product Size: 42 x 21 x 7 mm. Print Area: 17 x17 mm (3D laser engraved), 21 x 21 mm moulding). Print Process: PVC Moulded with 3D Laser Engraved. Delivery: 2-3 weeks (indent) from art approval. Standard Packaging: Poly Bag. Packing Details: 200 pcs per carton, 2.5 Kgs, 24x33x9 cms. Mini Bluetooth Speaker which offers excellent stereo quality sound and is compatible with all mobile devices that support Bluetooth. It has a wireless connectivity range of approximately 10 metres and can also be used with an audio cable. Playing time is 3-4 hours and it is easily recharged from a laptop, power bank or USB mains charger. Cube is presented in a Black box with a micro USB cable, an audio cable and an instruction leaflet. Colours: Black. Dimension: H 43mm x L 58mm x 58mm. Print Description: 35mm x 30mm. Print Type: Pad Print. Packing: Individual boxes. 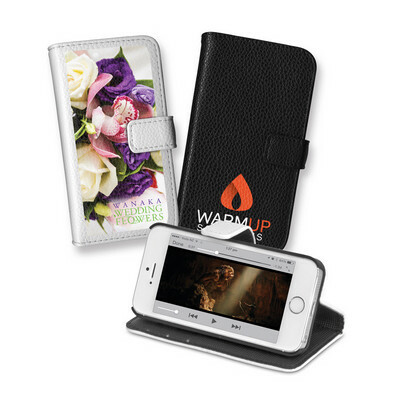 Features: Leather housing with metal clip, Grade A memory, 10 Year warranty on data retention, 2 year replacement warranty on faulty manufacture.. Certification: CE, FCC, USB2.0, RoHS. Product Colour: Black, Brown. Product Size: 85 x 30 mm. Print Area: 30 x 10 mm (print), 15 x 5 mm (laser). Print Process: Pad Print, Laser Engrave. Delivery: 2-3 weeks (indent) from art approval. Accessory Options: AC001: Lanyard, AC002: Mini Lanyard, AC003: Split-ring, AC004: Split Ring Chain, AC005: Snap Hook. Standard Packaging: Poly Bag. Packing Details: 200 pcs per carton, 4 Kgs, 24x33x9 cms. Features: High quality key-ring with Grade A memory, 10 Year warranty on data retention, 1 year replacement warranty on faulty manufacture.. Certification: CE, FCC, USB2.0, RoHS. Product Colour: Aluminium / Platinum / Chrome. Product Size: 60 x 25 x 8 mm. Print Area: 31 x 10 mm. Print Process: Laser Engrave. Delivery: 2-3 weeks (indent) from art approval. Standard Packaging: Poly Bag. Packing Details: 200 pcs per carton, 9 Kgs, 24x33x9 cms.